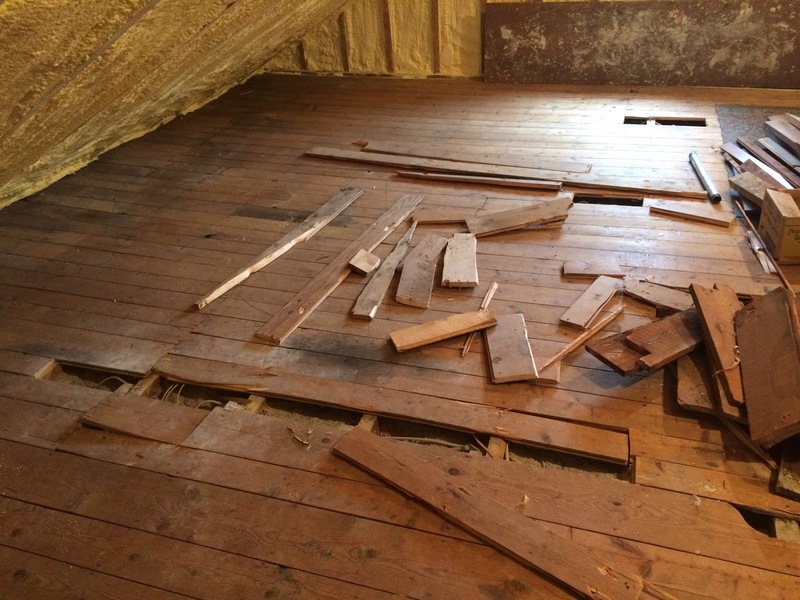 Previously, in the attic: we ripped up many of the floorboards to get at the second floor ceilings for electrical work. 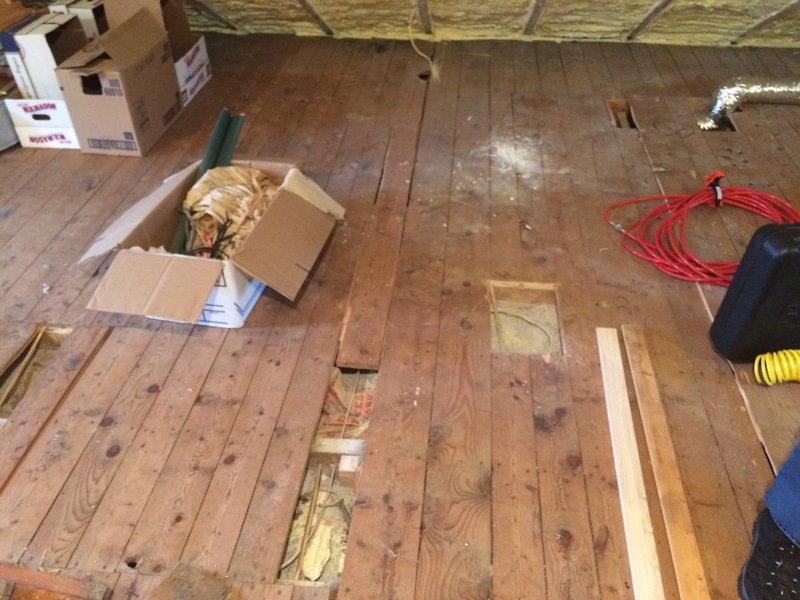 It was godawful work and it left the attic floor full of holes and looking awful. It stayed like that for a long time. We rewired in July 2015, which means it stayed like that for about 18 months. 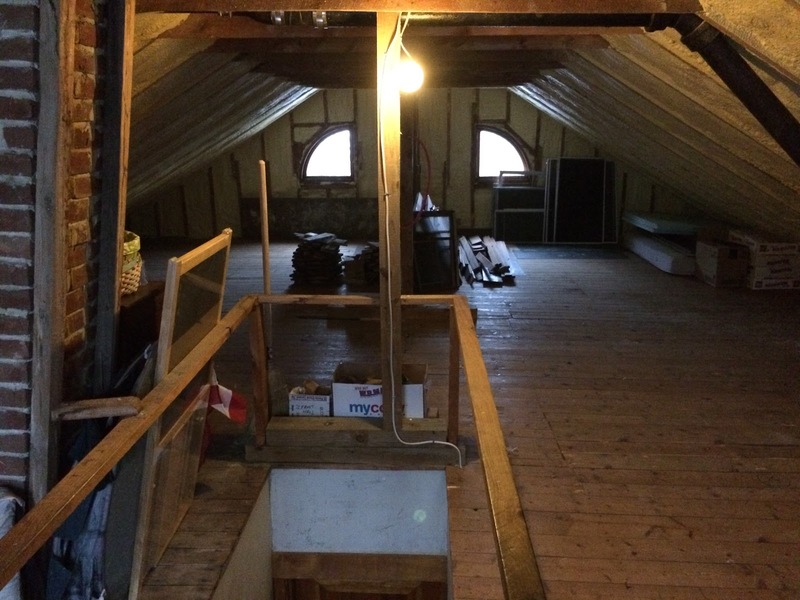 It made the attic a weird and dangerous place to be in. 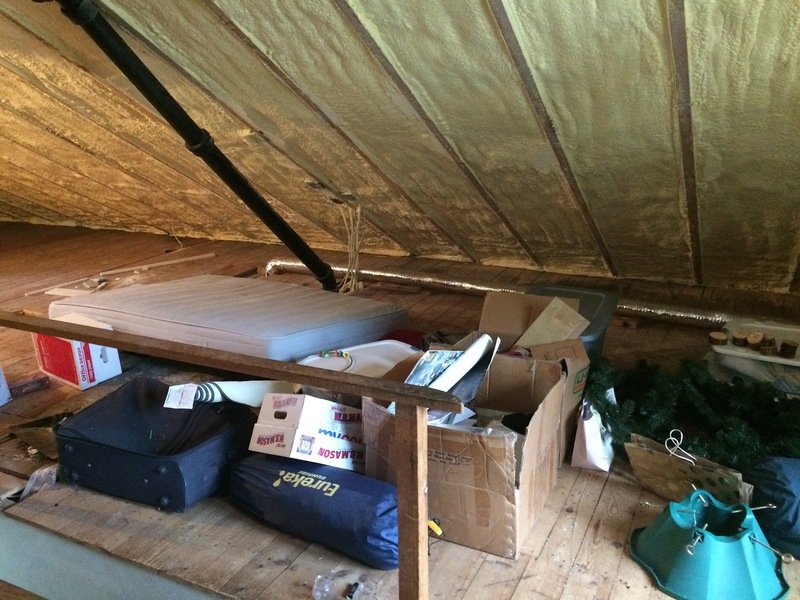 On top of that, as attics do, it had become a sort of dumping ground for extra stuff. 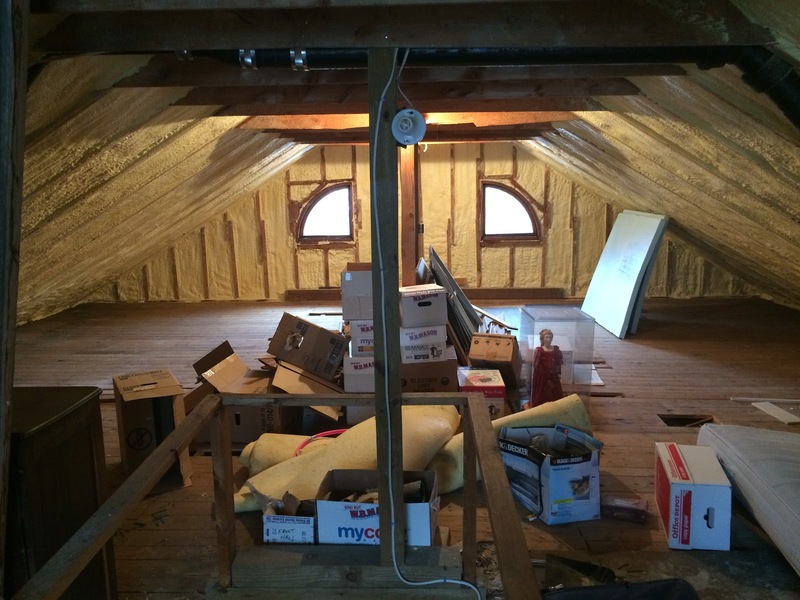 When my parents came up last weekend, the attic was the project I wanted to tackle. My dad and I re-matched the boards to their holes in a jigsaw puzzle that I have to admit I kind of enjoyed. 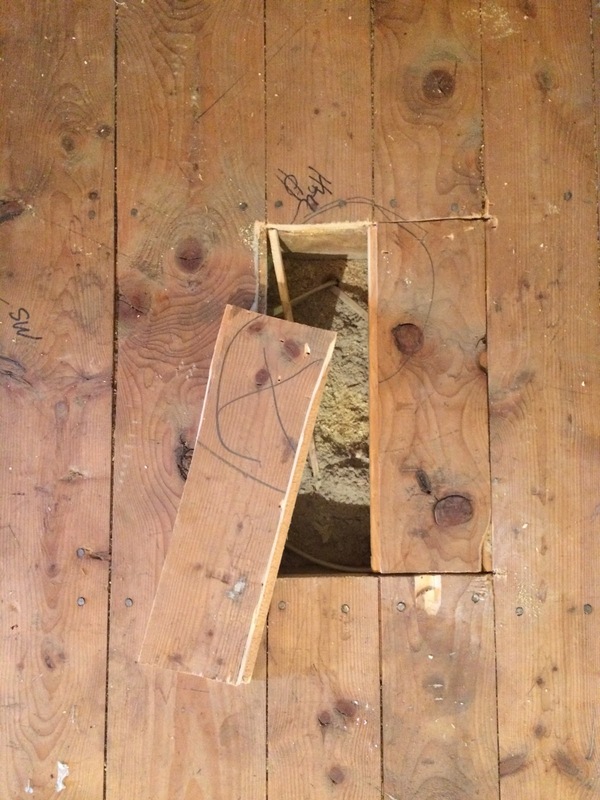 We got them back into their holes and nailed them down with a very fancy and more than slightly terrifying nail gun that my dad had brought. Some of them could just go right back down on their joists; some of them, like the ones directly above, needed reinforcement underneath. 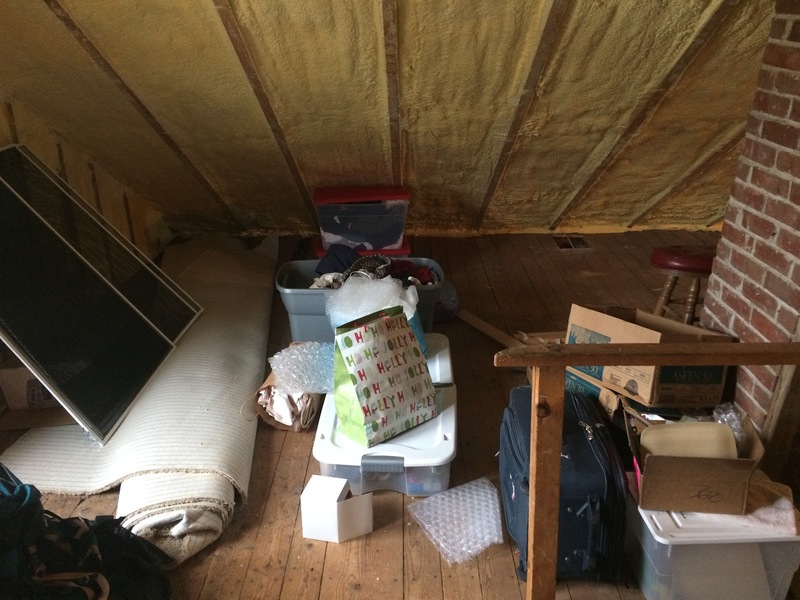 While we were doing that, my mom organized the attic. We threw away or recycled quite a few things and got the rest of it in MUCH better shape. I am really, really happy with this particular project. 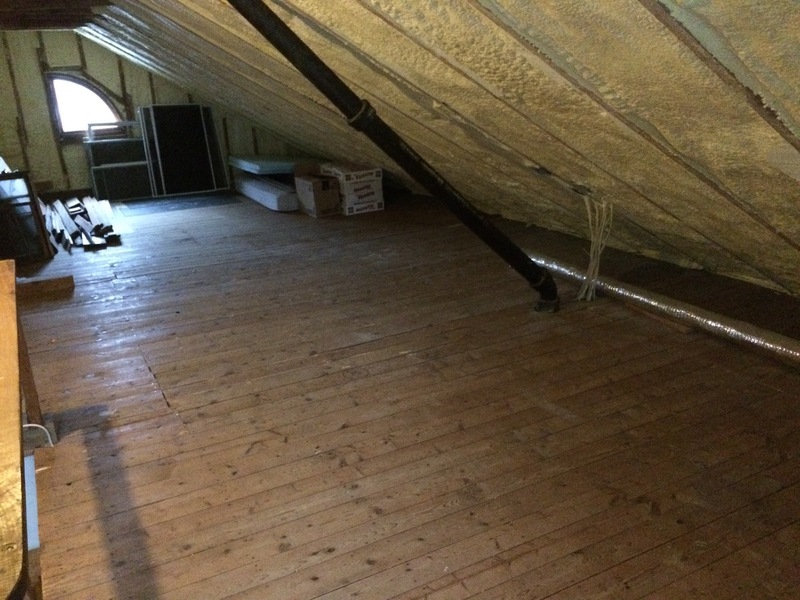 It was not complicated or exciting, but it has made a big difference in the usability of the attic, and it feels like we were finally resolving the tail end of the rewiring project. 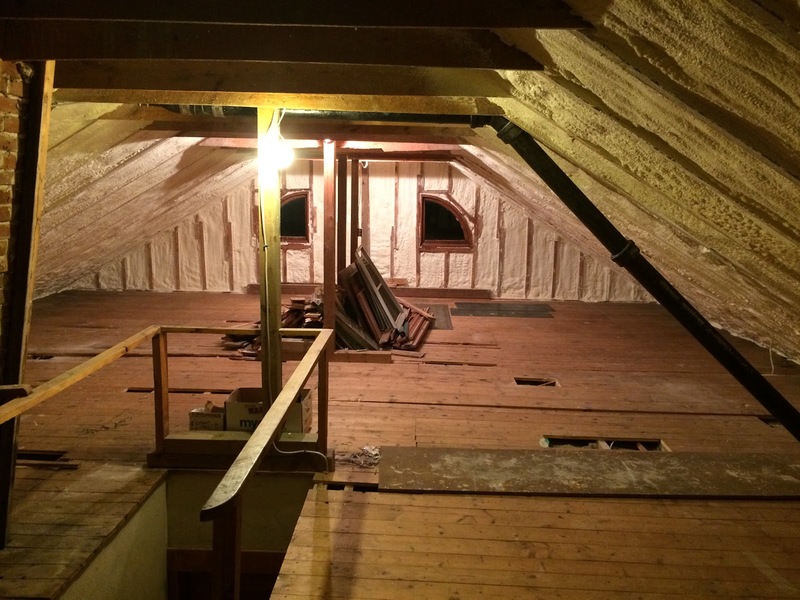 The attic is not yet done: next up we need to cover the exposed spray foam with fire-resistant paint, and then over that we’ll put up some really simple paneling. 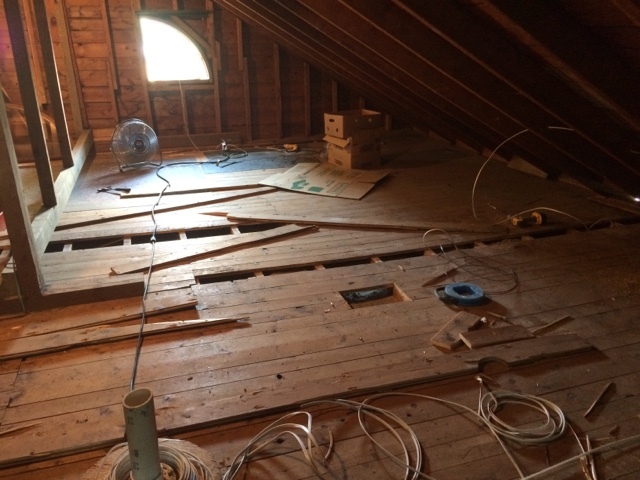 As part of that project, we’ll probably also do a kick wall, or a short wall coming down from the eave to the flooring, to cover the vent pipe you can see from the upstairs bathroom fan. 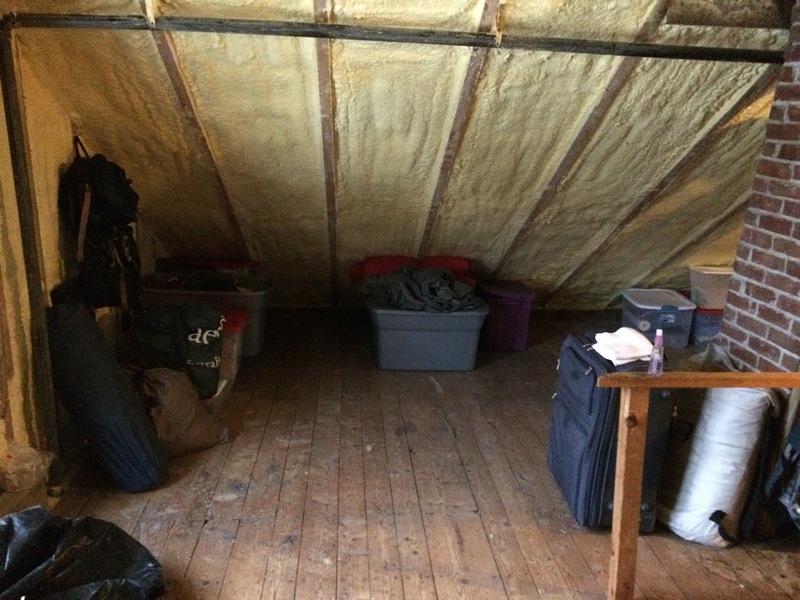 Probably that wall will be matched on the other side, which will give us both crawlspace storage and a wall against which to build some basic shelving so that all of the things that are currently (neatly!) stacked can go up on shelving. 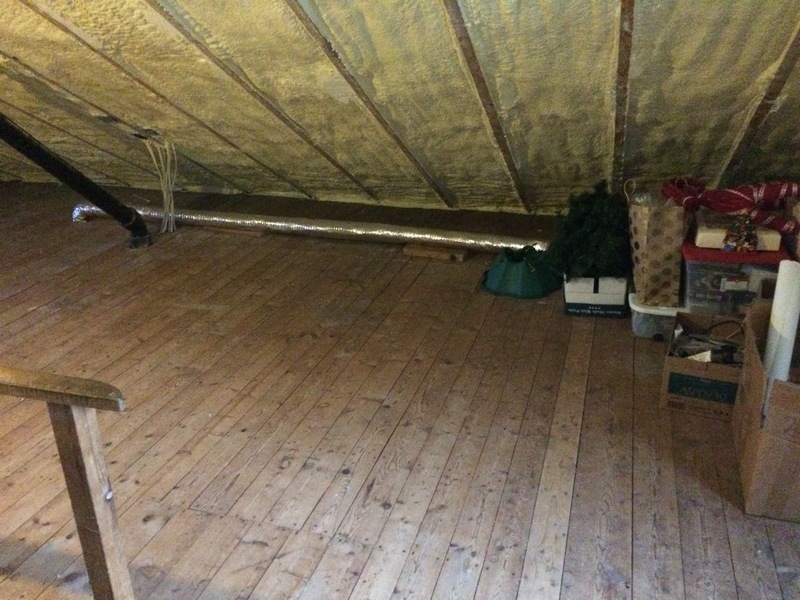 Because we insulated the ceiling of the attic, and not the floor, it’s fairly comfortable year-round. Once we get the paneling up, it’s going to be a perfectly fine extra room. It’ll be overflow space: maybe someone can sleep up there, maybe I can put a writing desk up by the quarter-round windows and pretend to be Jo from Little Women. Now that it’s usable again, anything is possible! You must feel so satisfied after finishing that up! 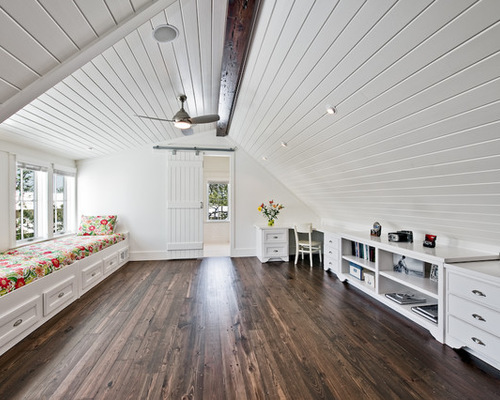 An attic writing room a-la Jo March would be AMAZING! Loved being part of the “after”! 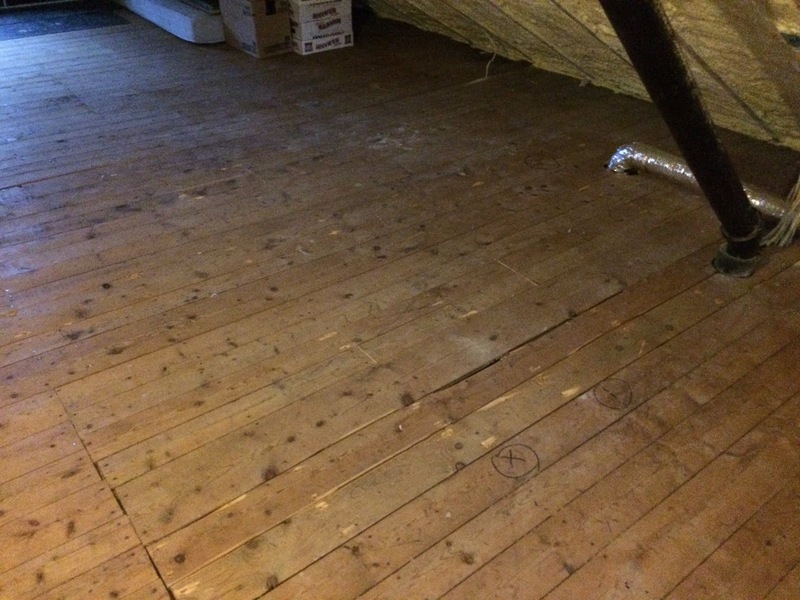 I've never seen an attic with a full floor like that. We just have a few pieces of plywood around the stairs to store stuff on. It looks great to me!